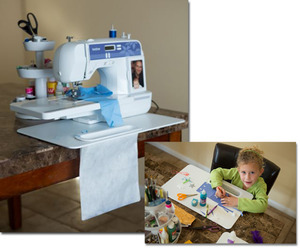 for Portable Sewing Machines and Sergers, Here are a few features and benefits: * Padded foam backing protects tabletop from damage. * Sturdy but lightweight, easy to store or take to class. * Fits all portable sewing machines and sergers. * It absorbs machine vibrations and provides a much quiter work environment. * The lifetime warranty heavy-duty catcher bag detaches easily for removal of contents. * For craft you can use on lap or pick up an entire project to watch TV or carry to another room.